The rise of the ‘paperless office’ has been predicted since the early 1960s, but the need to make paper copies has hardly diminished over the intervening 50 years. As Ben Franklin famously said, “A penny saved is a penny earned.” This philosophy is certainly relevant when using your inkjet or laser printer. According to testing, using the Verdana font produces 36% fewer text-based print outs than using Times New Roman. A well known laser printer is rated at 370W and prints 18 pages per minute. Printing for 5 mins per day, around 90 pages, will use just 11.25kWh of electricity, costing £1.58 per year. 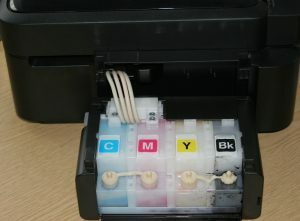 An equivalent inkjet printer will use even less, 1.3 kWh only costing 18p for the same printing. These numbers are very small, so remember the biggest savings come from reduced ink and paper usage. The cheapest 80gsm copier paper costs around £2 for 500 sheets, whilst the cheapest slightly heavier 100gsm paper costs upwards of £7 for 500 sheets. If you buy 5 reams (2,500 sheets) per year you can save £25, so buy the lighter weight! Don‘t print in colour unless absolutely necessary, save money by switching the print mode to high speed black and white​​. Multifunction printers (also called all-in-one printers) combine a printer, scanner and copier into a single device. Having all these functions in one unit not only saves space, but can also be more affordable than buying separate individual devices. If buying new, buy an inkjet printer with low cost, high volume refillable ink tanks. These can last for 2 years or up to 6,500 colour sheets! Ink and toner supplied by the original equipment manufacturer (or ‘OEM’) tends to be the most expensive. You don’t have to buy it! When purchasing a new inkjet or laser printer, search for these money saving and environmentally friendly features. Inkjet is ideal for consumers and small businesses with modest print demands. Laser printers are often more suitable for medium to large businesses that print a lot of pages. If buying new, buy an inkjet printer with low cost, high volume refillable Ink tanks which can last for 2 years or up to 6,500 colour sheets! Inkjet printers have low energy consumption, are inexpensive and permit the re-use of paper. If you are buying a laser printer, look for one with an ‘energy-saver’ feature, this reduces energy use when idle by over 65%. Even when idle, laser printers consume between 30% and 35% of their peak power requirements. 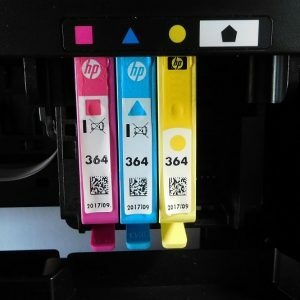 As a rule of thumb, the cheaper the printer, the smaller the cartridge, and the lower the number of pages that can be printed before the cartridge needs replacing. Pretty soon the cost of replacing ink cartridges will surpass the savings on a lower cost printer. Make sure you buy a printer that reflects the volume of printing you require. Print speeds are usually rated by how many pages are printed per minute (ppm). Image quality settings can affect print speeds and beware, many manufacturers derive speed ratings from draft mode to attain the fastest ppm possible. This is measured in dots per inch; black-and-white printers should have a minimum resolution of 600 x 600 dots per inch. Black-and-white resolutions of 2400 x 1200 produce high-quality print productions. Colour print quality of 1200 x 1200 is a good minimum standard, and a resolution of 4800 x 2400 produces excellent-quality colour printouts. If you plan to print frequently consider a printer with a large paper capacity, or optional additional paper feeders. Consider a printer that allows you to print on both sides of a page (however be aware that this can increase the time needed to print). If you buy a multifunction printer with built in printer, scanner and copier be aware that the scanning is probably suitable for business documents, charts, artwork, and non-professional photos. 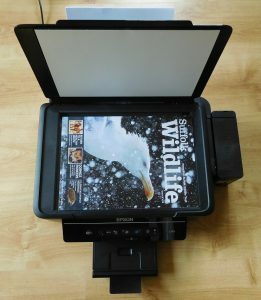 Professionals who want the highest quality photo scans should consider a separate scanner that can perform 48-bit scans. The scanner on a multi-function printer doubles as a copier. Look for an automatic document feeder if you want to be able to copy multi-page documents. MAXIMUM NO. OF PRINTED PAGES? Most printers give an indication of the maximum number of pages that should be printed per month. Estimate what you think is your maximum then double it, just in case other members of your family or team take a shine to your printer! Many people are unaware that there are two different types of scanner elements. A charged couple device (CCD) scanner is considered better for scanning graphic files. Colour contact image scanners (CIS) are thought to produce better text image scans. If you intend to copy a lot of documents using your MFP, then it is wise to choose one that has a higher copy speed of at least 25 pages per minute. You may find it useful to buy a multi-function printer which can resize documents. Document resizing from 25% to 400% is a common specification for most copier printers.